Full-length studio collaboration between noise titans Merzbow and Lasse Marhaug, the end result of myriad collaborations and preludes leading up to this, a definitive statement of unbridled aggression both monumental and gratingly banal. The two individuals involved have storied histories and epic discographies earmarking a shared career in sheer audio annihilation, leading to a pairing that could really only go one way: deep in the red. What's most interesting is the regression. Merzbow as of late has shown remarkable depth and restraint, contributing near glassinine moments of droning beauty to his work with guitarist Richard Pinhas, as well as achieving a psychedelic peak to his own newer guitar-based compositions. Marhaug too has always been a complex artist, willing to eschew volume for a certain stateliness in his work with Jazkamer, but never forsaking depth. On "Mer Mar," the meeting point is somewhere inbetween, with varying degrees of impact. Side A is given over to "Mar," a belligerent noise piece highlighting the extreme side of both artists. Opening on a caustic landslide of tonal filth and crippled electric detritus summoned at full bore, "Mar" rides a wave of refraction and distillation until the tidal waves of oceanic fuzz and bass become sputtering sirens and wails. 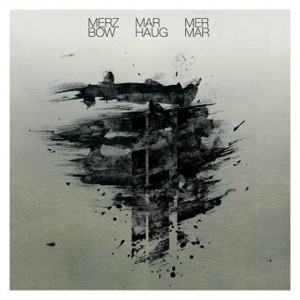 There's little space throughout the piece but an incredible dynamism as far as noise is concerned; Merzbow has always ridden this particular wave of crest and fall but for Marhaug the rise and recession seems a newer concept, as well as an overall richness of the composition as a whole. There's never really a dull or wasted moment across the track's epic twenty minutes; instead there's a wealth of cascading intensities giving way to a forbidding mountain of stylistic terrorism. Merzbow and Marhaug here erect a monument to the monumental, the ultimate expression of sound for the sake of sound without giving in to the saturation of HNW aestheticism. "Mar" breathes and writhes, a sickening snake of the vile that pollutes and obliterates along its self-mapped path to transcendence. Would that Side B could hold the same level of engagement. "Mer" is a far cry from the thoughtfulness shown on Side A, a throwaway demonstration of "clang and sturm" that betrays a certain pointlessness existing in the bosom of noise artistry. Both Merzbow and Marhaug are better than this; beating on pipes and assorted metals amidst an eruption of analogue effects is beneath even the ranks of Skinny Puppy at their most creatively void. The only thing missing are the sub-William Bennet vocal eruptions that define the footnoting of a genre. Banging on pots and pans (or pipes and sheets of metal, as the case may be) is the noise equivalent of buckets and washboards employed in the scattershot emptiness of clatter-psych. There's simply nothing meaningful or powerful to latch onto. The composition doesn't have to barrel down like a lava flow for its entirety ("Mar" illustrates this level of dynamic wonderfully) but it does have to pique the listener's interest, and "Mer" simply fails in that regard. It's the background noise of noise. This collaboration, then, showcases both the best and worst that this genre has to offer. Noise is often a mixed bag; it's never going to be consistent, unless said artist is working in the aforementioned HNW genre. But consistency is no substitute for the truly radical; Vomir's endless walls of static, though flooring, pale in comparison to the mindbending depth found in a work like "Hanatarash Five." Merzbow and Lasse Marhaug have attempted to negociate some sort of space in the middle, a place of extremity and calm. They have ultimately failed. The extremity comes easy enough to both, but the calm is elusive. Perhaps Merzbow needs the guiding hand of Pinhas to reach the plateau of purity and relaxation, and perhaps Marhaug needs the constantly changing approaches and interests of guitarist John Hegre to arrive at a sound both devilish and angelic. "Mer Mar" simply polarizes, never getting close to an agreement between its two extremes. As an example of sonics at their most unadulterated, it's magnificent; as an album it falters. Enter at your own risk.